Motorsport Connections opened its doors in December 1999 owned and operated by two keen racers, Mark Hinchelwood and Nick Liefting. Situated in Seven Hills, Western Sydney, MSCN is a 1/2 hours drive from Western Sydney Dragway, Parramatta Speedway, and Eastern Creek Circuit Track. The mission statement was simply, to supply racers with quality parts sourced from local and overseas suppliers. Both owners had years in the performance industry and both believed there was a huge gap in the industry for them to provide both professional service and a racer's inside knowledge. Motorsport Connections started off with one product line, a product from a company call 'Speedflow Hose and Fittings.' At the time of opening Speedflow was looking for a NSW dealer to distribute their hose and fitting range. The timing for both campany's could not have been better. MSCN took this product range and soon after was able to establish links with other hose and fitting companies. MSCN now stock entire product ranges for Speedflow, SF LITE, XRP and BMRS. After trading for a few years we printed the first Motorsport Connections Catalogue, The first few (updated and reprinted every 6 months) were printed in black and white and these days our catalogues are renowned across the industry and are printed in full glossy colour. A few years later we bought DEIST Australia, this evolved into a strong partnership with US owned and operated DJ Safety. And to date we are proud stockists of both of these lines of safety gear. Approximately 8 years after it's conception a decision was made for Mark to buy Nick out of his share of the business. Nick was offered the opportunity to purchase the Speedflow business. The Liefting family relocated itself to Taree, NSW and continue all production of Speedflow on site in Taree still to this day. In 2013 we made the decision to expand MSCN into Melbourne, VIC. Marcos and Mark relocated to Melbourne, Marcos remains there running our Morrabin Store while Mark moved his family to Victoria for 2 years, but then relocated back to Sydney to continue working and racing here. In 2014 The MSCN Turbo Altered set a new Australian National Record!! 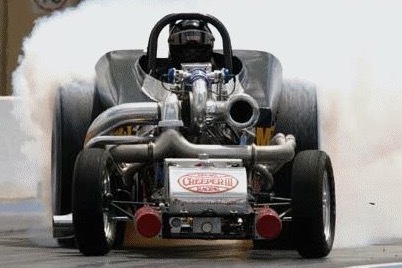 6.39@225mph! As the product range at MSCN grew so did the need for for space. Luckily buildings came up for sale next to our original and the decision to buy and expand proved worthwhile. As we grew so did our staff and admin facility and to date we occupy 3 buildings in Sydney and one in Melbourne. 2015 Was a terrible year for Mark. He was in an accident whilst driving the SAINTY Top Alcohol Funny Car. The incident resulted in some horrible injuries. Becoming aware of a fire in the foot well of the race car Mark made a decision to jump from the car as he was unable to breath. However, the chutes had been deployed and the engine was still running, Mark jumped clear of the car as the car continued with it's intent to cross the finish line. If that's not bad enough he was then picked up by and got caught in the parachutes and was dragged down the track, eventually being deposited on the track some distance from his boots which remained where he initially landed before the chutes yanked him clean out of them. Read all about it at..
2016 MSCN campaigned a 410cid winged Sprintcar for 20+ shows at Parramatta. Initially Mark had planned to drive but post accident this is not to be, so, with a rookie driver the car ran the season, it ran well and the decision to campaign the car for the following season when Mark was up to it, was made. 2017 As part of Mark rehabilitation riding his Mountain bike seemed to wake his "FROZEN" shoulder up. so along with some good friends a quest was decided on and together they road from the start of the dirt road in Cairns to the tip of Australia. Total kms traveled for the month of July passed 1750! so of the crazy antics on the bike during this trek earned him the nick name "MAD MARK"
The below picture shows mates helping mates along the way on one of the more pleasant roads traveled. In Melbourne, Marcos builds a Mazda 808 powered by a rotary motor (JAP-808) he went on the win the 2017 Jamboree show. First in class! woohoo! go Marcos!!! 2017 Mark makes a return to racing! no small feat considering the obstacles he had to overcome to get back in that drivers seat. As MSCN moves into 2018 we are proud to be associated with many great companies, and to be involved with so many fabulous race teams. We want to thank our loyal customers for all their ongoing support. We have not buckled on our "NO Chinese Crap!" stance and continue to supply only quality products.